Burchett was the first Western journalist to report on the devastating after effects of the atomic bomb dropped on Hiroshima. “I write this as a warning to the world.” So began the story filed at Hiroshima in August 1945 by Wilfred Burchett, the first Western journalist to witness the devastation of nuclear war. While 250 journalists were reporting on the Japanese surrender, Burchett alone realized the real story was in that doomed city, officially off limits to outsiders. World War ll was the last war that Australian Wilfred Burchett was to report from his countrymen’s side. It was his firm conviction that the West was wrong in Korea, and wrong later in Vietnam, and the stories he filed outraged the West. The Australian Government denied him a passport for 17 years, forcing him to live in exile. In tracing Burckett’s life and the wars he covered, Public Enemy Number One raises many issues of vital importance. 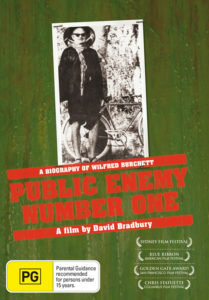 A gripping part of the film occurs when filmmaker Bradbury was ambushed with Burchett by Cambodian guerillas on a mountain road. In the tradition of photojournalism, Bradbury’s camera kept rolling, recording the bloody scene. Burchett escaped injury but can not escape the irony that confronted him in Cambodia. The Pol Pot regime which he had championed had turned Cambodia into a killing ground worse than Hiroshima. Had his loyalties been misplaced after all?